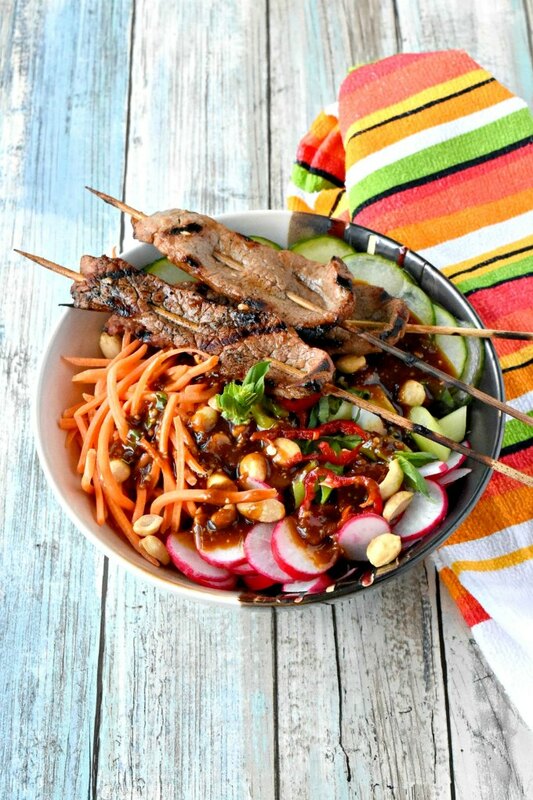 A specialty blend of peanut butter turns into the most delicious noodle bowl of all time! 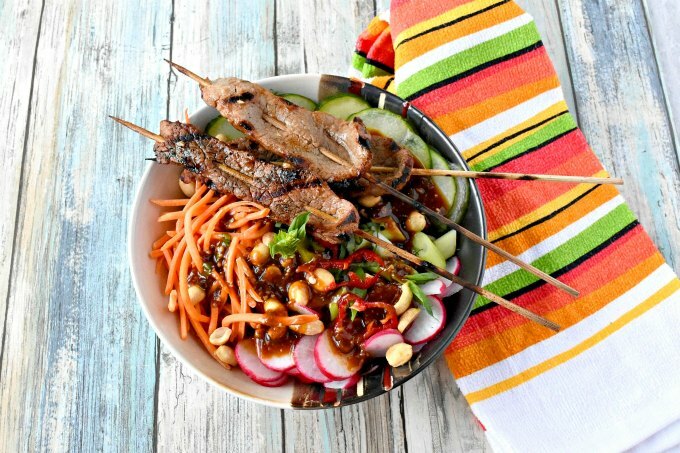 Satay Beef Noodle Bowl is packed with crunchy vegetables, spicy Thai peanut butter, tender pieces of lean beef, and rice noodles. Every bite is packed with a flavor punch you will love. It’s the last day of #FarmersMarketWeek. The week has just flown. Did y’all save some of the delicious recipes shared to make later? I know I have. Some of them just look scrumptious! Not to mention my own recipes that I can’t wait to make again. Those sloppy joes I shared yesterday were SO good. I hope you try them for dinner or use the chicken mixture for lettuce cups. I know I’ve talked about all the interesting and delicious things my farmers market has to offer. Well, today I’m highlighting something a little different for a farmers market find. Nut butter. This is not your standard peanut, almond, pistachio, cashew nut butter. Oh no. This is a deliciously flavored nut butter. I’ve walked by this booth quite a few times. Knowing full good and well that I would want to purchase something. Because, well, I have an addiction to nut butters. Who doesn’t, right? I guess those that are allergic to tree nuts? But then there’s sunflower and soy nut butters. I could devour a jar of sunbutter, for sure. So, I as again, who doesn’t? Sprelly is a rather new company around these parts. They offer up gourmet PB & J sandwiches and crepes at their eatery. But they’re also spreading out into selling their butters and jellies. Yes, pun intended. That day they were sampling their Salted Butterscotch Peanut Butter. I tried that and it was just as I had hoped. Sweet and salty with a nice butterscotch flavor. Then, I had to try their Sweet Thai Chili Peanut Butter. No brainer, right? You’d want to taste it to, wouldn’t you? It tasted EXACTLY like I wanted it to with a little more kick than I was expecting. Oh yeah, baby. This peanut butter has a nice spicy kick that sneaks up on you like a surprise guest at party that puts their hands over your eyes and says, “Guess who?” and you really have no clue. But when you find out it’s such a great surprise to see them. That’s what the spiciness is like in their Sweet Thai Chili Peanut Butter. What does one do with spicy, Thai peanut butter? 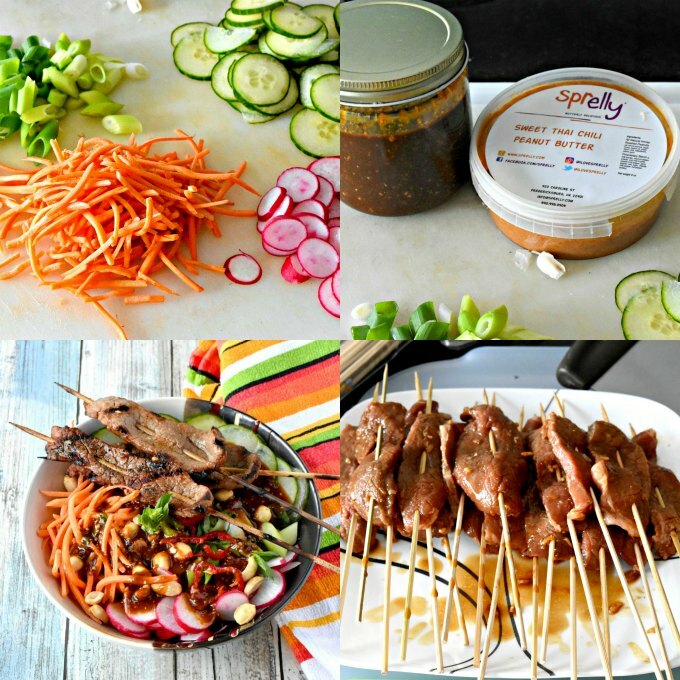 Make some delicious satay sauce! 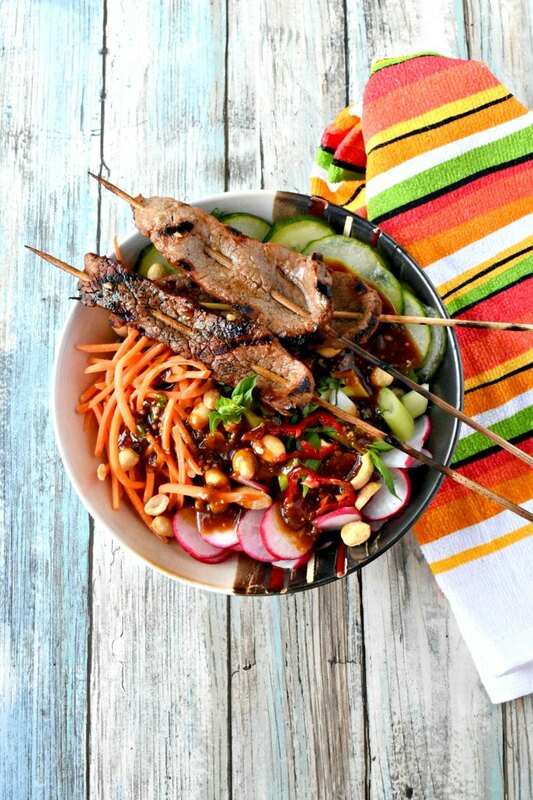 That goes on top of an equally delicious noodle bowl topped with tender, marinated beef. Yup. I went there. 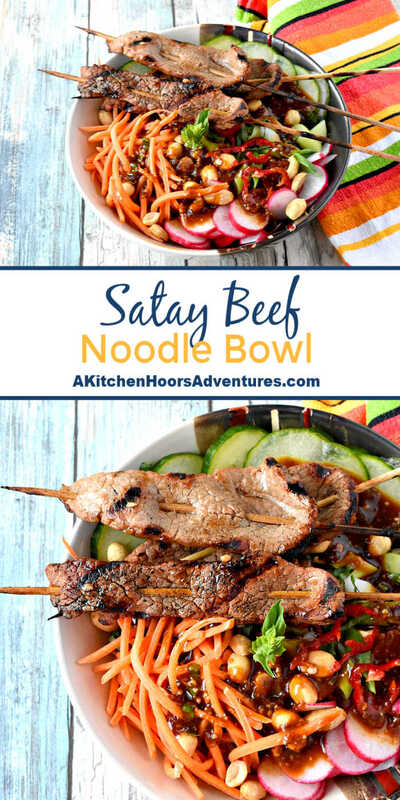 And it was oh so delicious and worth every bite of this satay beef noodle bowl. Obviously, those brightly colors vegetables were purchased at my farmers market, too. The crisp cucumber, crunchy radishes, sweet carrots, and spicy green onions. So much color and flavor in one bowl is almost a sensory overload. I said ALMOST. It doesn’t help that the noodles absorb the flavors of the dressing making each mouthful just bursting with flavor. If you haven’t made anything with rice noodles you really should. They’re sponges for flavor. I’ve made quite a few recipes with them because they’re’ not only sponges but also easy to cook. Just soak in water and then simmer. How simple is that? I just have to toot our own horn with those little red rings there. They’re the peppers we’ve been growing in containers on the balcony. We have peppers, tomatoes, jalapenos, and a slew of herbs. Our oregenos, both of them, are over growing their pots. This means we have to step up and use them or dry them. We’ve taken to using them this last two weeks. I chopped several stems off yesterday for a chimichurri. OH so good. Just look at all those colors! And that tender beef. It’s packed with so much flavor you can’t imagine. Oh yeah! There’s some basil on there, too. Because you can’t have Thai anything without some basil. At least in my head that’s how it works. And peanuts. You can’t have Thai without some peanuts on top. Please tell me I’m not alone in this? I hope you check out Sprelly. It’s really delicious nut butters. I hope they’re there, this weekend. I maybe have to get some of that salted butterscotch. Be sure to follow them on Facebook, Twitter, and Instagram to see what new flavors they come up with! Combine all the ingredients in a mason jar and shake until combined. Refrigerate until ready to serve. Combine the soy sauce, ginger, garlic and sesame oil in a mixing bowl. Add the beef and marinate 30 minutes. Preheat the grill to high heat. Thread the beef slices onto wooden skewers. Grill on high heat 2 to 3 minutes per side or until cooked through. Place the noodles in the bottom. Top with the cucumber, radish, carrots, and green onions. Drizzle with the dressing and sprinkle with peanuts. 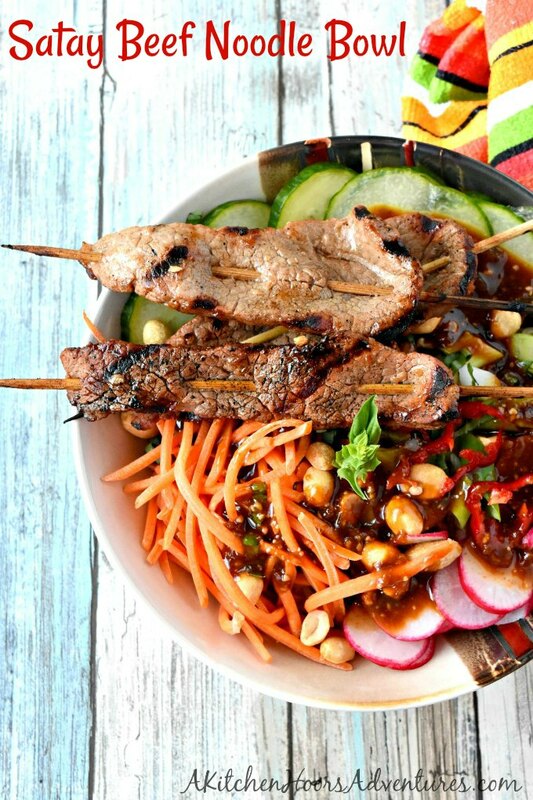 Place 3 to 4 skewers of meat on top and serve. How many serves does it make? It should make 4 servings. There might be more dressing than for 4 servings, but the rest of the ingredients should make 4 bowls. I’m going to have to keep an eye out for Sprelly nut butters or make my own, because this looks like such an amazing bowl of deliciousness! They’re out of Fredericksburg, VA. I think they have a list of markets they’re in on their site. This is such a beautiful bowl of deliciousness! I’m going to be making this real soon! I love bowl meals, and this one is now my favorite! Amazing flavors! 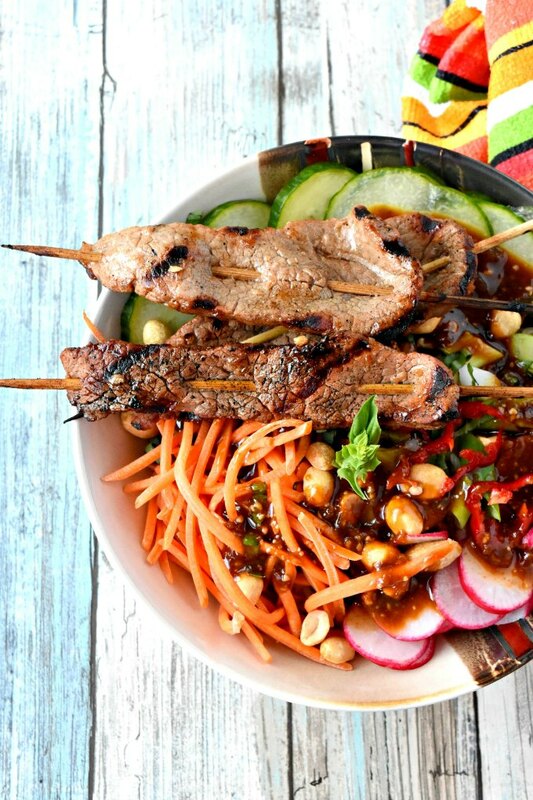 I love satay flavors and this looks delicious! So colorful too. Thanks! They’re so good, aren’t they? Now that just looks delicious! I love the extra kick of which you speak. It was definitely a hidden kick when I tried their PB. Now I can’t wait to try some of their other flavors. I absolutely love this recipe! The flavors are perfect and the colors in the bowl are amazing! Your red peppers are a perfect addition too! Thank you! We’re pretty proud of our little garden. I can’t get the hubs to try tofu. I love it, but he won’t even budge. It would be perfect with tofu! That looks so full of flavors and textures! YUMMMMMM! What a find…..I am so jealous of your posts this week! Where am I ever going to find any sprelly near me? Thanks for including the substitute in your recipe. Our little market is pretty big! I’ve been to larger markets with not as much interesting produce and products. If you have a good Thai chili paste you can mix that with crunchy PB for a decent substitute.